Divide the avocado in two; remove the pit and half the meat of each avocado half. Chop the removed avocado meat. Mix it with the juice of half a lime and sour cream and put it back into the avocado halves. Sprinkle the finely chopped onion and spread it over the sour cream. 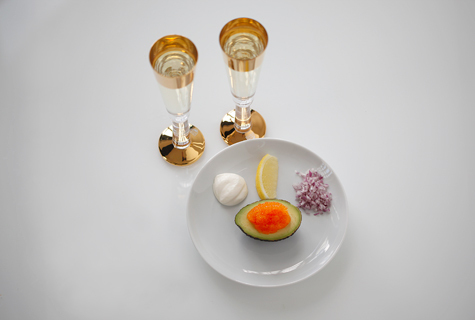 Put the Caviar of Kalix on top. Decorate with chives and a slice of lime. Serve with bread rolls. Cut the bread into rectangles and fry it crisp in little butter. 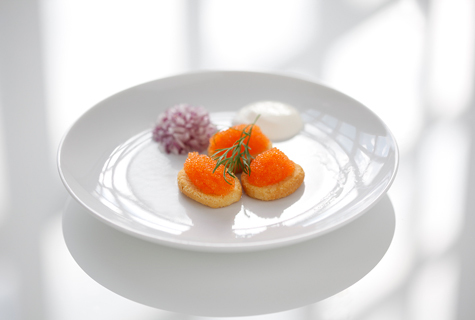 Shape the Caviar of Kalix to an egg with the help of teaspoons, and place it on the bread. Shape the sour cream in the same way and add next. Garnish toast with onion and a dill rocker. Shock coriander seeds in a mortar. Place them in pan with oil. Heat to 40 degrees and let cool. Chop the salmon and season with coriander oil, salt and pepper Let rest for one hour in refrigerator. Form four small burgers and top with Caviar of Kalix, chopped red onion and fresh coriander.